No matter the job - big or small, tough or delicate - the Blue Guardian Knife Set gets it done with unrivaled grace and strength. Providing a level of cutting potency and versatility you just can't get from any single knife, regardless of features or price, this set includes two outstanding knives. 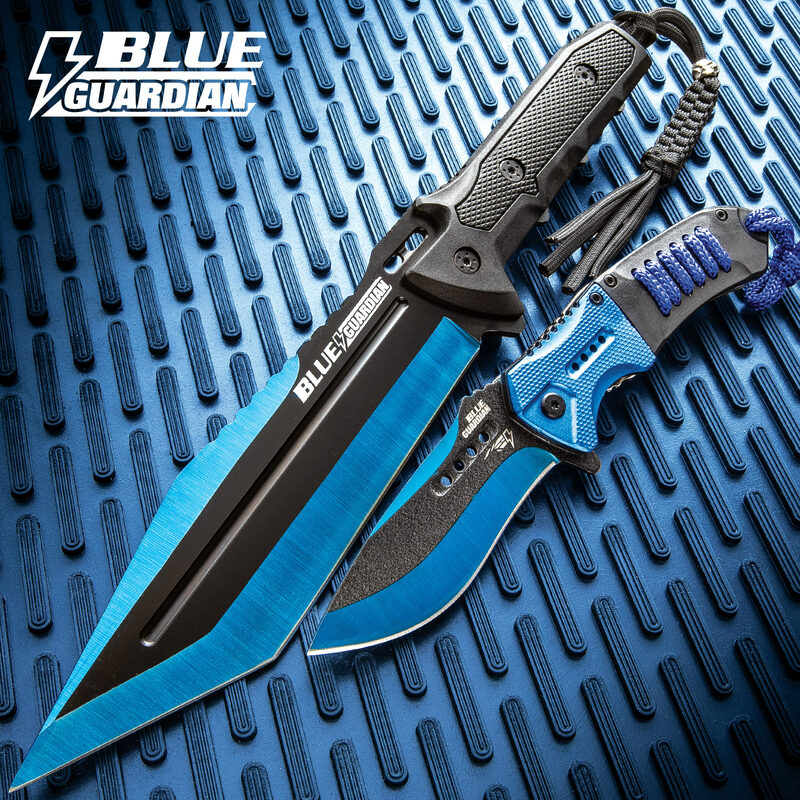 Both Blue Guardian knives boast razor sharp stainless steel blades, tough polymer handles and smart two-tone trim throughout. The set's stout fixed blade knife is perfect for vigorous, large-scale cleaving jobs, while the graceful assisted opening pocket knife is especially well suited to fine tasks that call for a more delicate touch. 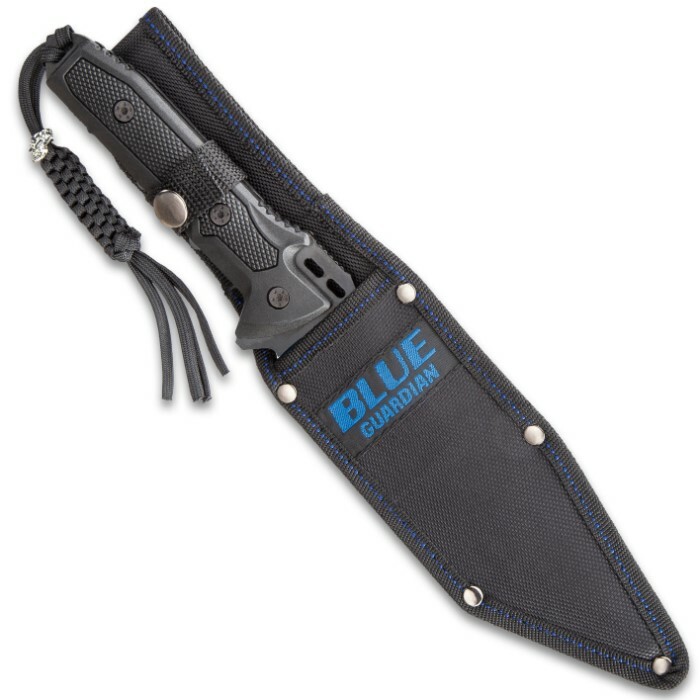 Big, bold and robust, the Blue Guardian fixed blade boasts a penetrating 7" tanto blade, finished in black and blue and etched with the "Blue Guardian" logo. The handle is textured and contoured for an ergonomic wielding experience and includes a convenient lanyard hole at the pommel, plus, a nylon belt sheath for ease of carry in the field. 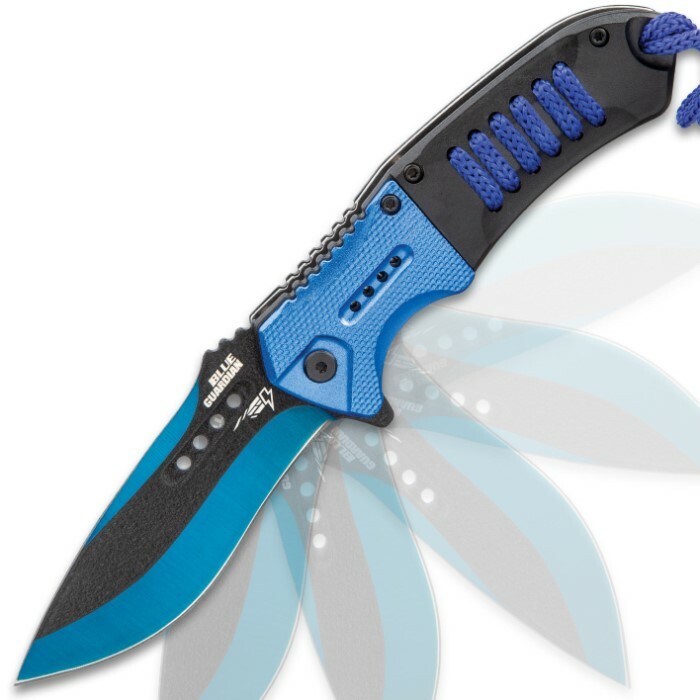 The pocket knife's 3 1/2" modified drop point blade is edged in brilliant cobalt blue, offset by an intersecting band of textured matte black with chic through-holes and "Blue Guardian" etchings. Thanks to the velvety smooth assisted opening mechanism, the blade deploys with lightning speed. 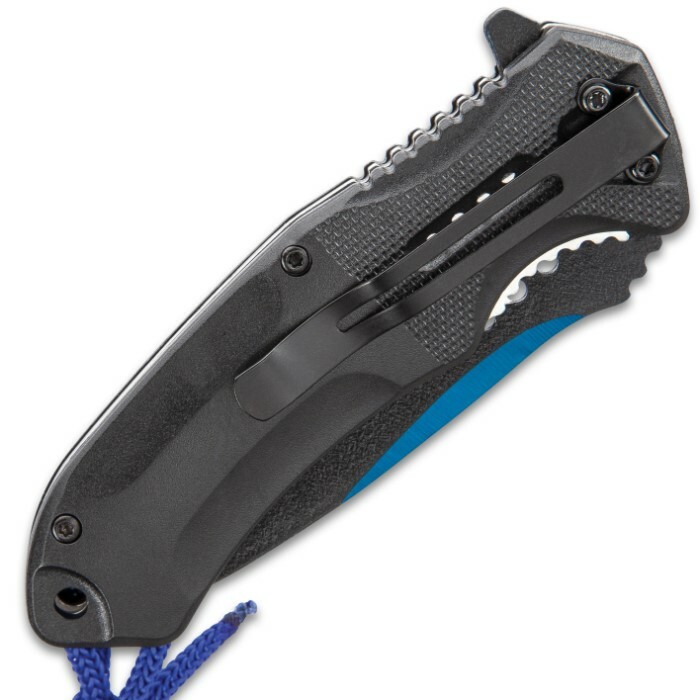 The blade's black-and-blue color scheme and through-holes are mirrored on the handle, which is interwoven with blue paracord for a comfortable grip and unique look. The cord also serves as a handy lanyard, providing - along with the integrated pocket clip - added safety and security during transport. 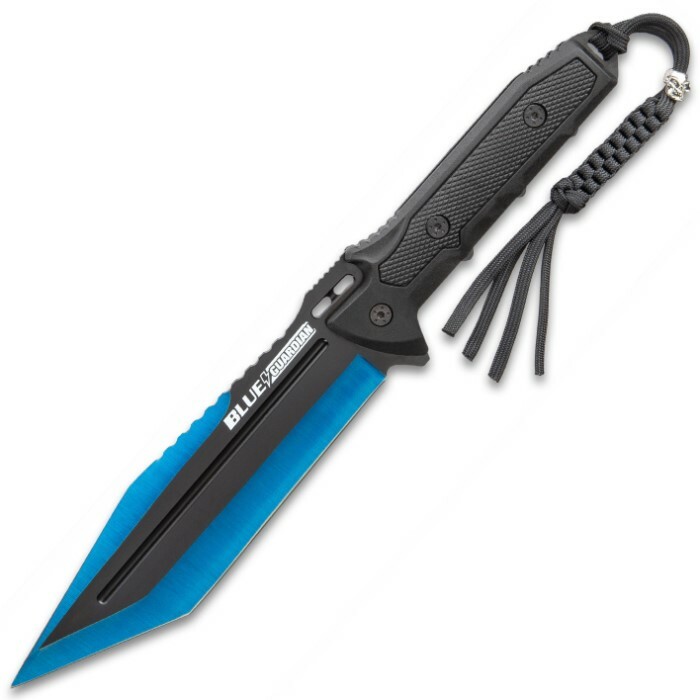 Black Legion's Blue Guardian knife set packs double the sleek, double the style and double the ferocity! I love both of these knives so much, but the pocket knife is just a real beast. I love the look, I love the weight, and I love the blade. A very nice set which should be very serviceable for 'light to medium" usage. Large knife is "full tang" which is an essential in my opinion. Set is on sale occasionally, which is a plus. Assisted opening on folding knife functions very well, very quickly, and locks in place securely. As in all knives and tools they should be used with their capacities in mind, in my opinion; I would recommend this set since it is well built. All of the "Black Legion" knives I have purchased have been of good quality. Welbilt knife that I am enjoying a lot. Very happy with my purchase.